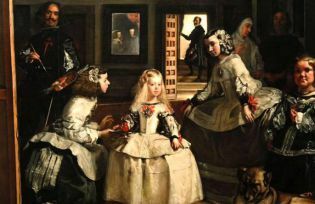 A posthumously published book by the art historian Michael Jacobs on his long standing obsession, the Velazquez painting, "Las Meninas", that hangs in the Prado - a painting that has perplexed art historians for two centuries. Michael Jacobs, the art historian and travel writer specialising in Spain, South America and good food died in January 2014 leaving his book on Diego Velázquez’s masterpiece Las Meninas unfinished. This enigmatic painting had fascinated him all his life even from his earliest years as a schoolboy during an early trip to Madrid and he was determined to get to grips with the mystery at the heart of the painting. Time was not on his side, he had been diagnosed with cancer, but with the help of a friend and kindred spirit, the acclaimed journalist Ed Vulliamy, he set out to pass on all of his enthusiasm, knowledge and personal involvement in the painting in the hope of retrieving the project from publishing oblivion. Jacobs’ book was never completed but Ed Vulliamy has managed to smooth over the rough edges with his informative preface and coda that take us through the history of the book and his relationship with the author in the final months and days of his life. Ed Vulliamy is the first to admit that the end result is a “half-book” but loyal readers of Michael Jacobs will be undeterred. This is less of a book and more an act of profound friendship, an attempt to pull back a dear friend from the shadows of the Underworld, to which he was consigned prematurely at the age of 61. Michael Jacobs from all accounts had a contagious joy in him with a sprinkling of anarchy too – he rarely went unobserved. His passing is a great loss. 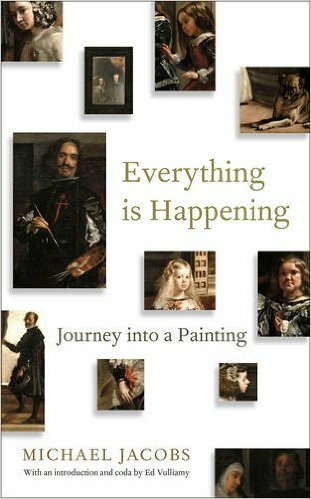 Even if the book appears to be hanging in a sort of limbo, Michael Jacobs enthuses the reader with his delightful obsession with the painting that led him to dig into the archives and uncover the many interpretative theories about the painting that have held sway over the last two centuries. Las Meninas (The Maids of Honour) has fascinated and charmed an army of art historians and has been dubbed “the first modern painting” and was even described by the painter Luca Giordano as the “Theology of Painting”. It is a seemingly impossible painting to interpret, open as it is to endless interpretation. However, if in any given culture and at any given moment, there is always only one episteme that defines the conditions of possibility of all knowledge, whether expressed in a theory or silently invested in a practice. The defining intellectual barriers of an era. Foucault was fascinated with Las Meninas for the very reason that the painting straddled two epistemes, that of the Renaissance and that of Modernism. It was a gateway to the the future. Or as Foucault would have it it epitomised the shift from classical representation to representation in its pure form. Velazquez’s multiple perspectives are what have so perplexed historians. The setting for the painting was Philip IV’s Alcázar palace in Madrid. Velazquez painted himself at work in the royal court alongside the Infanta Margarita, the meninas, a dog and dwarves. The royal couple are present but only reflected in a mirror at the back of the room but it is unclear if the mirror reflects the painting that Velazquez is working on or if they have actually appeared as spectators to the scene of the Infanta being painted. The puzzling feature is our inability to understand who is looking at whom. Is Velazquez, looking at the royal couple, King Philip IV and his second wife, Mariana of Austria, or at the viewer of the painting? Or are they one and the same? Does the viewer shift in and out of the royal gaze? Are we looking at the painting or is the painting looking at us? What is the focus of the painting, the Infanta, Velazquez himself, or the viewer of the painting, or everyone at once? Or is the key to it all the mysterious figure both coming and going at the back of the room? The focus is elusive as is the painting’s meaning. When you keep looking you realise that quite literally “Everything is happening”. Michael Jacobs during his sleuthing in Madrid also followed up a lead and found the man who was responsible for “saving” Las Meninas during the Spanish Civil War, by having it shipped to Geneva, and later after the war back again to Madrid, to joyous acclaim. He takes a scholarly approach, but then discards its inherent stuffiness and offers a highly charged emotional response to the painting and art history in general, thus joining a long line of disinterested scholars who are both erudite and disobedient, the perfect mix. It is a fascinating book that makes you miss Michael Jacobs more than ever. Ed Vulliamy has done an excellent job moulding the text into a coherent shape and his comments are both enlightening and sensitive to his delicate task. Highly recommended.